Successfully Added Black Allure - Mini China Cell Phone (Quadband, Dual SIM) to your Shopping Cart. The Black Allure, an easy to carry Mini China Cell Phone that is fun, sleek, and useful. Everything you ever wanted from a mobile phone for only a fraction of the price and size you would expect, but with twice the style! This highly desirable Mini China Cell Phone comes with a highly response 2.5 inch flat touchscreen and easy-to-navigate touch icon interface. The inside of the Black Allure Mini China Cell Phone is just as impressive as the outside and includes the same superb functionality you would expect from brand name phones. Features include full native quad-band functionality (850MHz, 900MHz, 1800MHz, 1900MHz), two SIM card slots for business and personal communications, full bluetooth support for ease of use on the town or in the car, and fully unlocked for use on the network of your choice. PDA Tools: Make your day go smoother with the Black Allure Mini China Cell Phone as your PDA. Includes a calendar, world clock, to-do list, alarm calculator, sound recorder, unit and currency converter, and more! Analog TV, Video/Music Player: Powerful analog antenna picks up your favorite TV channels for free! You can also transfer your video files for viewing in fullscreen on the Black Allure's 2.5 inch screen. SMS text messaging, MMS media messaging, MSN Messenger: Stay connected! Use the virtual QWERTY keypad, or even handwriting input, to easily send multimedia or text messages to your friends and family. Designed to be the easiest phone you will ever use, the Black Allure Mini China Cell Phone was made for today's busy lifestyle and will cater to your every need, whether you are a corporate executive or soccer mom. The Black Allure is expected to be one of our top sellers and makes for a great resale item due to the combination of high quality and low price, so be sure to get yours before the fad starts! In stock now for single piece or large bulk purchases, order it now and we will express ship it out the very next day - Brought to you from the leader in online factory direct wholesale China electronics - Chinavasion. Does the Black Allure come with an analog TV tuner? 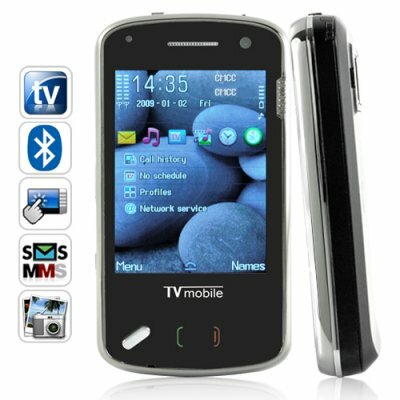 Yes, watch TV and be happy with The Black Allure mini phone. What is Dual Standby and does the Black Allure have it? A phone which is designed to work with 2 Subscriber Identity Modules (SIMs) are called Dual SIM phones. Of these Dual SIM phones, the ones which allow both SIMs to be active at the same time so you can receive calls on both are called Dual Standby phones. Yes, the Black Allure is a dual SIM, dual standby phone. ALLURE, the name starts it all. From its sleek smooth finish to the compact very efficient design this name says it all. I've had this phone about a week now and played with it enough that i can say i understand how it all works (and how its suppose to work.) First off, if you text alot this phone may not be the best to start off with, although the screen works perfectly when touching it you have to learn to work with the area in which it responds to. Texting can be a chore with your thumbs as mine are not the smallest but they are not huge either and i have to slowly push the EXACT point on the keyboard to "reach" the "a" button or "q" or "z." Basically any button that is on the far left side of the screen. Maybe this is a problem with my particular phone but the best and beleive it or not fastest way to text is the included stylus. All in all with a little of computer skills you can add various files to better your time with your phone such as movies, with the proper sized card i can see full movies being watched on this phone. FM radio works as expected, very close. HA HA Otherwise phone very good alternative to expensive brand name phones (samsung) and definetley something to seriously consider in bracketed terms. O yes, very very easy to set up on a prepaid plan using dual sims and extend coverage from different carriers, the set-up i have is t-mobile, and a local network called cellular one. Works perfect when i travel, one business one personal.